So you know that feeling of eating too much during the holidays but not wanting to throw out the delicious leftovers? Yes, I’ve been guilty of that too. But this year, I wanted to share a recipe that can include that delicious turkey from last night into a more waistline friendly meal. This is what I call my Post Thanksgiving Sandwich. Think of a typical sandwich minus the carb loaded breads. Instead, I substitute bread slices with tofu slices. 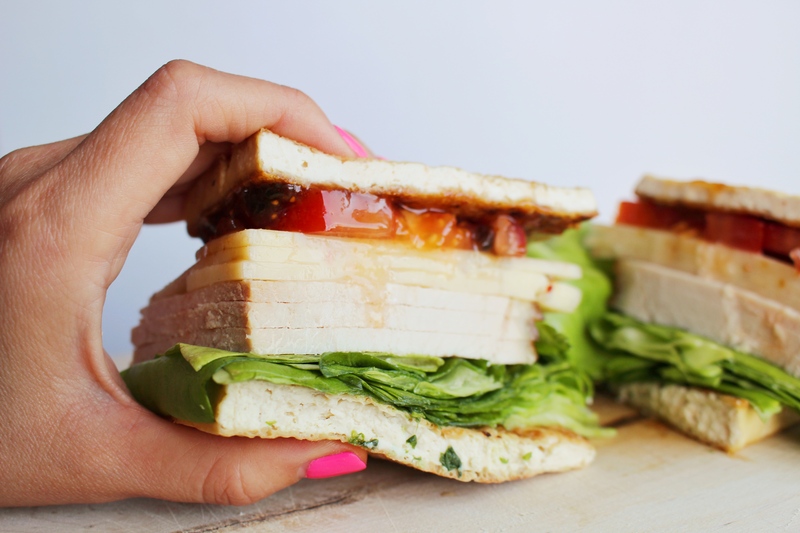 And bonus… these sliced tofu keeps the sandwich together as well as absorbs all the flavors from the ingredients. Pat tofu slices completely dry with a paper towel; this process is important since it will help make the slices more crispy like toasted bread. Set large non-stick sauté pan on medium heat. Then melt the small sliver of butter or spritz a bit of cooking spray before carefully placing the tofu slices on the pan. Cook for about 10-15 min on each side or until you see that it’s a golden brown color; you can also add a pinch of salt to the tofu slices as an option. Set aside on a paper napkin when done. 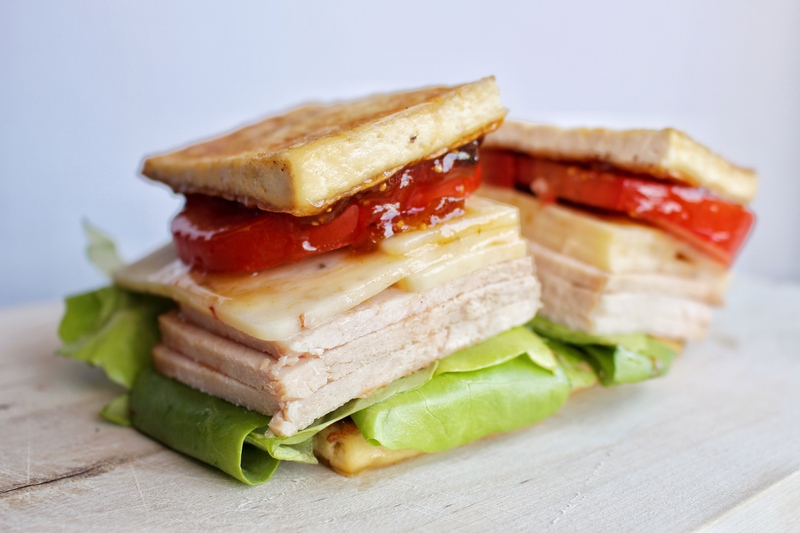 To stack the sandwich, start with one slice of cooked tofu, add 2-3 pieces of lettuce, 2 slices of tomatoes, 2 slices of the spicy pepper jack cheese, and 2-3 oz of sliced turkey. Top of the sandwich with one more tofu “bread” slice; add 1 tbsp of fig (cranberry) jam on the top tofu slice (optional). Repeat directions to make the second sandwich and serve. This sandwich looks so delicious . I want to try this recipe! OMG, I didn’t even know you could use tofu as bread. It looks so yummy. I seriously want to try this recipe.